Migratory birds are flocking to their summer breeding grounds in Iceland, and puffins are no exception. 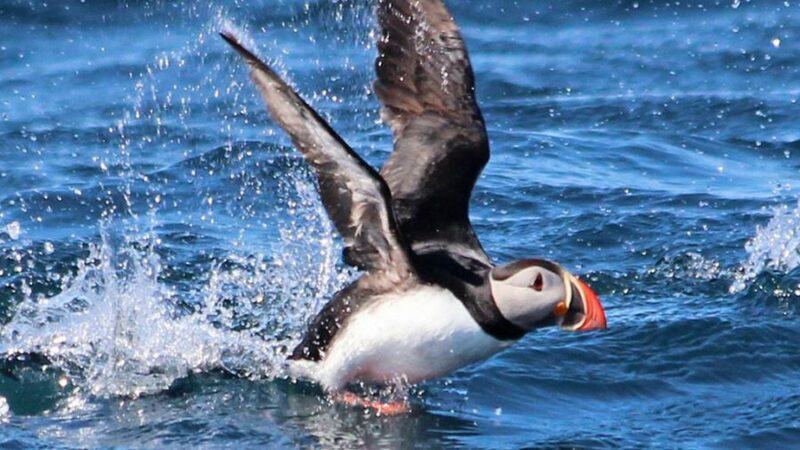 RÚVreports that Svafar Gylfason spotted the year’s first puffin while fishing at sea near Grímsey island, North Iceland last weekend. Svafar has been recording the spring return of puffins in the area for 19 years. He says the beloved bird’s appearance is a week earlier than it’s been in the past. Atlantic puffins spend most of their lives at sea, but return to coastal locations to breed during the summer. By early May, most of Iceland’s puffins have returned to their breeding grounds, where they will dig burrows in which females lay a single egg. The puffin’s conservation status was recently rated as vulnerable by the IUCN. Last year BirdLife International declared the Atlantic puffin in danger of extinction. Climate change and human fishing activity seem to be factors in the bird’s population decline. Over half of the world’s population of Atlantic puffins breeds in Iceland, or some 8-10 million birds.